In 1985, in the sleepy windward district of Puna, on Hawaii’s Big Island, the Tarring ohana (family) began carefully cultivating a very special banana crop. Since then, the ohana farm has become one of the largest producers of Hawaiian apple bananas on the Big Island, with 100 acres harvesting year-round. Named for their candy-sweet flavor, Hawaiian Candy Apple Bananas are grown on the verdant slopes of Hawaii’s most active volcano, Kilauea. Fed by the combination of lava enriched soil, tropical sun, and high humidity, the crop is tempered by the growing region’s copious annual rainfall of as much as 200 inches. These unequalled climatic circumstances combine to produce the distinctive, robustly sweet, yet piquant flavor of Hawaiian Candy Apple Bananas. Smaller than the more common Cavendish variety, Hawaiian Candy Apple Bananas are firm, but moist, and the flesh has a slightly pinkish tone, which deepens with cooking or baking. The smaller size and sweet flavor makes these bananas especially appealing to children, and provides a healthy, naturally sweet snack. 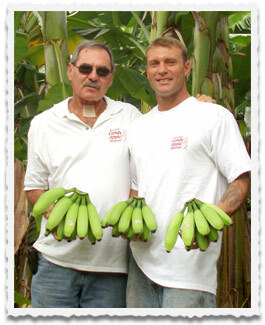 The Big Island is the largest domestic producer of bananas in the United States. The Tarring’s Ohana Banana Farm is one of the largest suppliers of fresh apple bananas in Hawaii – and the world’s only supplier of Hawaiian Candy Apple Bananas.